I have had this bike for a while — see the Wonder Woman tag. 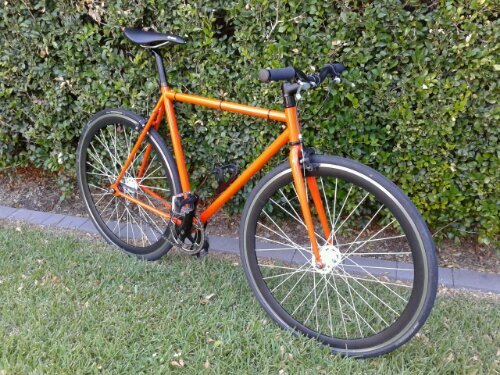 I built the bike up from a Cell Bikes fixie frame along with many parts that I had in a box from other bike projects. The intent of the bike was to use it around town to run down to the shops, post office and local cafes. 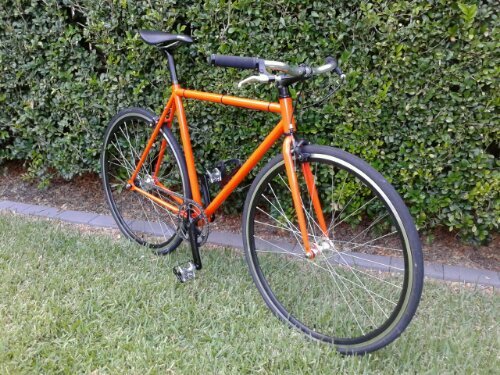 The bike was a parts bin special that I had built for less than $200 that I could happily leave at the front of a store without worrying too much if it was stolen. The bike has a 46 tooth chainring and a 17 tooth freewheel — that actually makes it a singlespeed, not a fixie. 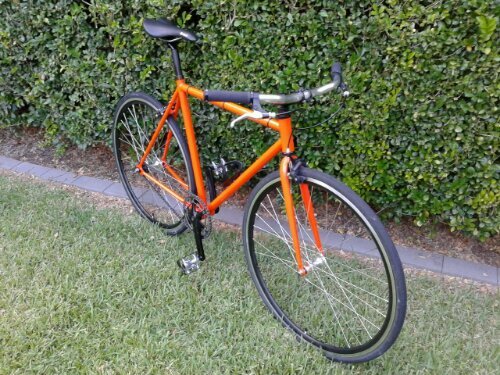 In this configuration — but with Shimano SPD pedals, not the flats in the following photo — I have riden the bike around the Brisbane River Loop at an average speed of more than 29 km/h. 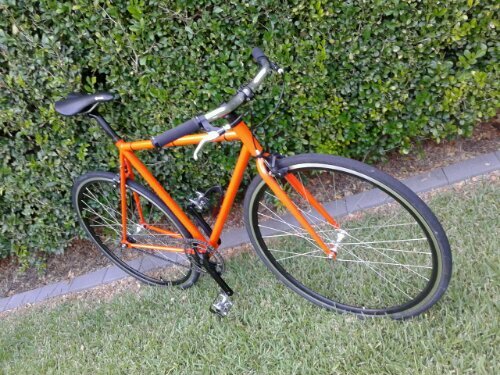 With the next Brisbane Style Over Speed ride fast approaching, I decided it was time to modify the bike to make it more of a sit-up bike — a bit more style and a little less speed. 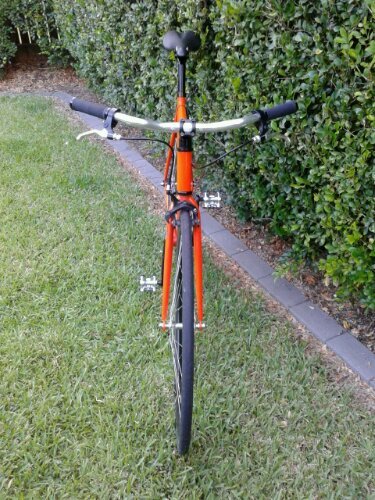 The main change was the Velo Orange Milan handlebars. I decided the deep V rim wheels of the original build did not go with the stylish look, so purchased a set of Marvinator wheels from Gear Shop Brisbane. The final change was a set of VP Components VP-X92 double sided SPD-compatible/platform pedals. 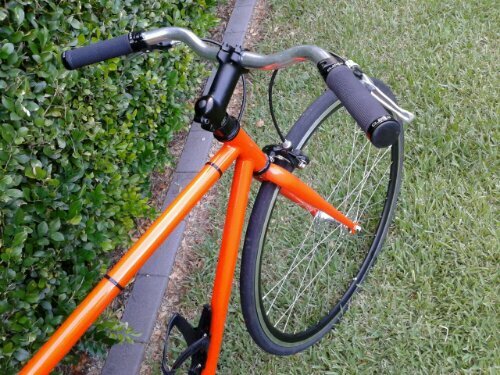 I reused the handlebar grips, brake levers, freewheel, tubes and tyres from the original bike build. This entry was posted in Bicycles and tagged Cell, Cell Bikes, Fixie, Marvinator, Singlespeed, Velo Orange, Wonder Woman on 31 March 2014 by Rex.